When we’re in challenging seasons of life, taking time to rest is usually one of the last things on our minds, but actually, it should be one of the first. Resting can mean taking an actual rest by stopping our usual activities and allowing our minds, bodies, and spirits to be renewed. But resting can also occur while we’re still working. Based on this passage, resting in my day-to-day life for me has always been the idea of stopping and starting - stopping whatever God wants me to stop doing, and starting whatever God wants me to start doing. When we come to Christ, we have to stop whatever we’re doing, drop whatever we’re carrying, and start doing whatever He tells us to do, as well as to start carrying whatever He gives us to carry. What about you? What would resting in your season look like for you? I can tell you from experience, the longer you stress and strain under your own yoke, the more stress and strain you’ll experience in your season. The longer you carry your own burdens (or other people’s burdens), the longer it will be before you can receive the “light burden” He has for you (like a special task He’s created just for you that will bring you so much more joy than what you’re doing on your own). That is how we rest: letting go of what’s not from Him and taking up what is from Him. That’s how the work becomes easy and the burden becomes light. That’s how we find joy, peace, and rest for our weary souls in the midst of a silent, hectic, difficult, or painful season. How can you start resting today, dear friend? Father, what do You want me to stop doing? What do You want me to start doing? Make a list as He speaks to you and then, do what He says. 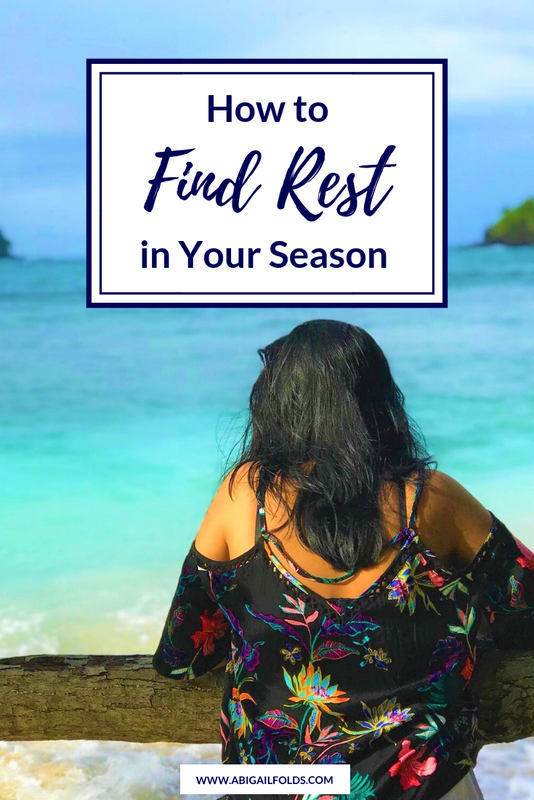 Wanna learn to rest in your own season? This blog post was originally a letter that I sent out to my online community. I send out encouraging letters and devotionals like this every other week, along with free resources, special offers, and lots of love and prayers! If this sounds amazing and you’d like to be in on all the goodness, then join below and you'll automatically receive my free journal guide on finding purpose in your season. It's totally free and you can opt out at any time. If you’d like some 1-on-1 support as you’re beginning to move forward in your life, faith, and season, I’ve got you covered. Click the button below to read more about how we can work together in your own unique season and calling. I'm so ready... tell me more!